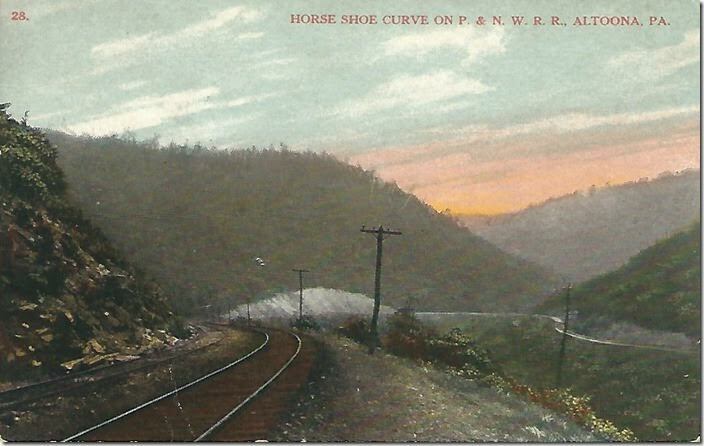 A few years ago I acquired this 1909 post card off Ebay showing a horse shoe curve on the P&NW RR near Altoona. I thought it might be the PRR line from Vail over the mountain to Osceola Mills, but evidently from other photos I’ve seen it wasn’t. The P&NW ran from Bellwood, just east of Altoona, to Horatio, a mile or two out of Punxsutawney. There have recently been two postcards on Ebay showing this line. I have a softcover on the railroads around Clearfield, and it indicates there were two lines – the PRR branch from Cresson and he P&NW – passing through Coal Port. I haven’t done any more research on this, but it is interesting that five railroads assaulted the Allegheny range in the vicinity of Altoona: PRR Mule Show, PRR Horse Show, the Wopsononock, P&NW, and the PRR Osceola-Clearfield line. Only one is left today. 1. P&NW horseshoe curve. Altoona PA. Postcard. 2. The length of the P&NW main line was 61.5 miles. If measured from Horatio this 59 mile post would be very close to the junction with the Pennsy main line at Bellwood. P&NW scene. Point Lookout PA. Postcard. 3. P&NW depot. Coalport PA. Postcard. 4. PRR depot. Coalport PA. Postcard. 5. 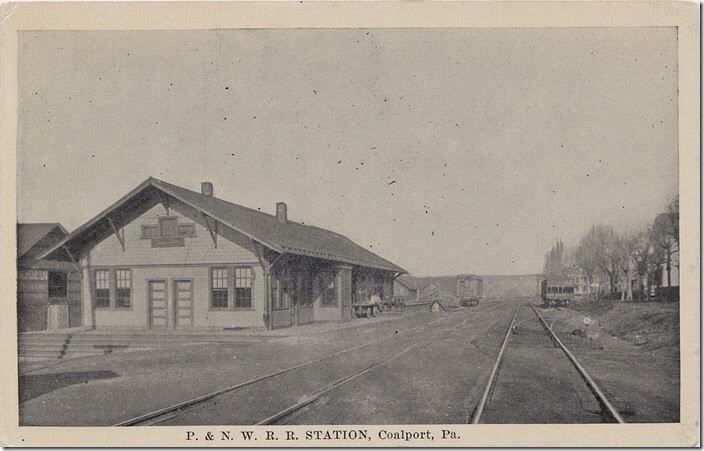 The P&NW gets a little mention in the PRR’s 1946 history except to say it taken over by the Pennsy in 1902. That would explain the ownership of the depot above. 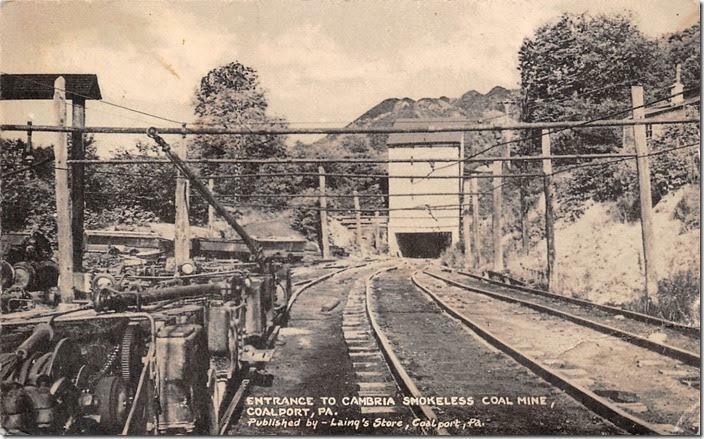 Cambria Smokeless mine. 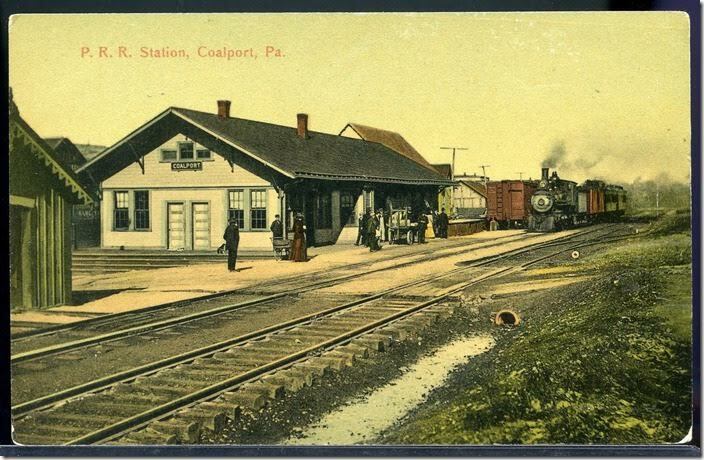 Coalport PA. Postcard. 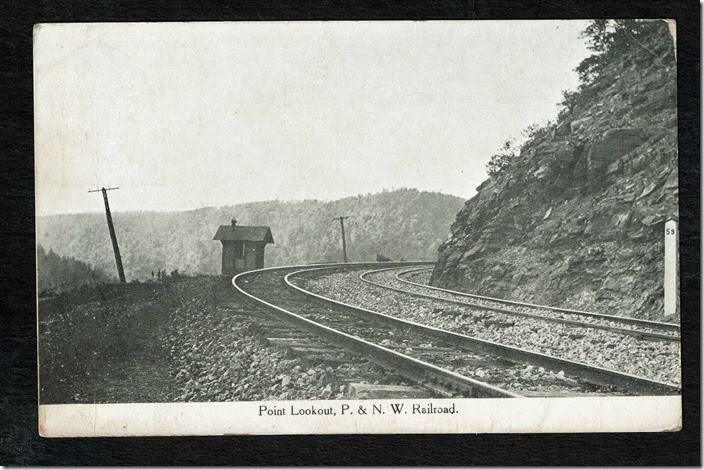 Like the Wopsononock, the P&NW started life as the Bell’s Gap RR, a narrow gauge. The portion from Bellwood up to Blandburg was evidently abandoned prior to 1945, the date of my PRR C.T. 1000 C (List of Stations and Sidings). Although still called the Bellwood Branch, it connected with the Irvona Branch which came north out of Cresson. Copyright 2011-2018, CSX Transportation Historical Society.